Laure-Auguste de Fitz-James, Princesse de Chimay (1744-1804) was one of the numerous children of Charles Berwick, Duc de Fitz-James (1712-1787) and his wife Victoire de Louise Josèphe Goyon de Matignon (1722-1777). She was married to Philippe Gabriel Maurice Joseph d’Hénin Liétard, prince de Chimay on 28 September 1762 at the age of eighteen. Sadly, the couple did not have any children. Madame la Princesse was known to be excessively devout, charitable, scholarly and sweet natured in personality and also inflamed with a passionate pride in both her romantic Stuart heritage and her military hero father, the Duc de Fitz-James. 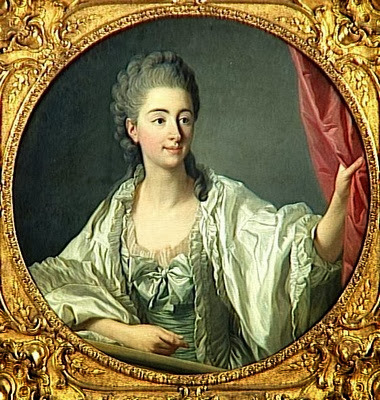 After her marriage she became a lady in waiting to Queen Marie Leczinska, Louis XV’s similarily devout wife who was fond of the young girl, who had a gravity beyond her years. After the Queen’s death in June 1768, the Princesse like all of the other ladies in waiting found herself out of a job until the arrival in France two years later of the young Dauphine Marie Antoinette, who was eleven years her junior.Surprisingly the two young women seem to have hit it off and as soon as she became Queen, Marie Antoinette was to have her promoted to Dame d’Honneur, supplanting Madame de Noailles.